I started on these socks in July. The last time I showed them, I had barely started the ribbing of the cuff. 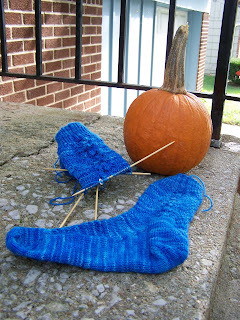 The pattern is from Nancy Bush's Knitting Vintage Socks - Child's French Sock in Citron Pattern and Diaper Knitting. I have yet to figure out which part of the sock is the Citron pattern and which the diaper knitting. 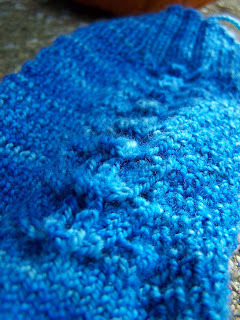 The yarn is Claudia's Handpaint Sock Yarn. The color has always reminded me of a cool, deep swimming pool full of water. I chose this pattern for the yarn as the central portion of the pattern reminds me of the ripples made from someone swimming through the water. The side portions of the pattern remind me of tiles that might be lining the pool.